Nellie O'Hara: "A Word for Canada: 'Crank Up the Oil Rigs!'" "A Word for Canada: 'Crank Up the Oil Rigs!'" Nellie O'Hara (formerly Nellie Balandowich) interned with me at XP Ministries, and she is rock solid. I love her prophetic flow, but I especially love her godly character and deep, unwavering passion for Christ. Recently, as I was driving, I heard the Lord speak over Canada: "Old structures are falling down. Old ways of doing things are not working anymore. The days of back-room meetings, the days of hoodwinking, those days are over. Those days are gone." I hear the Lord saying, "Transparency ... transparency is the freedom that is coming to this land. Transparency in thought. Transparency in deed. Transparency. I see prosperity falling as the snow falls ... ever so gently. There is prosperity falling across this nation from coast to coast as old structures are being taken down by their very foundations. "I see a people rising. They are saying, 'It's enough, enough!' I see eyes being opened, I see ears being opened and yes, there is an awakening. Finally! Finally I have a people who are listening to My voice. Finally, I have a people who hear My thoughts and are willing to go forth – are willing to put their foot towards their future. Oh, you have all seen the tsunami coming. You have all seen the tidal wave coming, but there is a reckoning, a reckoning that has to do with justice for the founding fathers of this country. There is a reckoning that has to do with recovery and restoration and restitution for the destiny of this nation." I hear the Lord saying, "I give you this nation, as a gift. It is My gift to you. It is My promise," says the Lord. "I continue to say, 'Do not fear, do not be shaken.' The turnaround of what man's agenda was is here." Crank Up the Oil Rigs! I hear the Lord saying, "It's a go! Crank up those oil rigs, for there shall be a flourishing of oil that shall begin to lubricate the flatlands. My oil is landing in hard places that have been made dry and recalibrating the soil, birthing forth the dreams for this nations. For the intercessions of My people crying out have gone forth and they are causing the sea to part. The only dry land is that which you will cross over as you enter into the promises I have for this nation. "My oil is landing to restore a nation. Not only a nation, but your dreams. Not only your dreams, but your desires. The oil is being cranked to restore your foothold and plant your feet firmly to a path that has been carved out for you. The oil is refreshing your bones and those dry places are coming alive. "False idols are crumbling and your children are rising, for I have seeded within a generation a foundation that is building to take the structure of withholding off of your limited view. "There is an inner oil rig inside of you, and hear Me this day: the oil is going to flow. The oil of My Spirit is going to flow and dismantle that which is not in alignment with My dream for you and for your destiny. My oil will flow, and My oil is going to burn. There will be burning ones who are relevant to walk in My ways and My love, and My love will burn through their veins. As My oil flows, the oil of this nation will flow and prosper. "The oil will flow in government. The oil will flow in education. The oil will flow in media. The oil will flow in ministry. The oil will flow in every area. The oil will flow into the cranks as the oil rigs are being cranked up. "There will be a seven-fold return on what has been stolen. I will redeem," says the Lord, "I will redeem the days. I will redeem the destruction. I will redeem the time. I will redeem the hurt and the agony. "The days of great healing are coming upon this nation. Liberty and plumb lines of righteousness and the true freedom that comes with these are hovering as their holding pattern is being readied to land. Just as My hand swept across the United States, My hand will sweep across this nation." 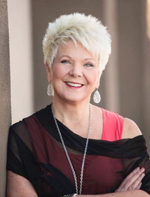 Nellie O'Hara (formerly Nellie Elaine Balandowich) works as an itinerant minister and is in full-time ministry with Christian Services Association with Patricia King Ministries in Canada and co-labors with Jane Watrich. After graduating as valedictorian from Bible School, Nellie served as an ordained minister with a church in Burlington, Ontario for four years. Nellie lives a prophetic lifestyle and has the heart of an equipper and mentor and a desire to see the Church come into her fullness and to be relevant and authentic to all generations according to the Word of God. Nellie has a love for this generation to see it raised up equipped, and walking in the gifts. She teaches how to overcome by understanding the process, walking in unity and sharing personal, powerful testimonies on the path of restoration and keys into fulfilling your destiny. Nellie now lives in Ottawa, Ontario Canada with her husband.